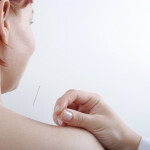 Our naturopathic doctors are trained in Acupuncture and Traditional Chinese Medicine. Acupuncture is an ancient form of medicine that has been used for more than 2500 years to support the body’s healing ability. Acupuncture treatments address the underlying cause of illness and take a restorative approach to bring the body back into balance.